Resolved, That the 77th General Convention request the Joint Standing Committee on Program, Budget and Finance consider a budget allocation of $1,000,000 to implement this resolution during the 2013–2015 triennium. The diocese of Michigan applied for a matching grant to begin work responding to the increasing Latino population in our region. I was surprised to learn that Michigan is home to the 5th largest Latino population in the United States so this work is vital to our communities. The Rev. Marcia Ledford and the Rev. 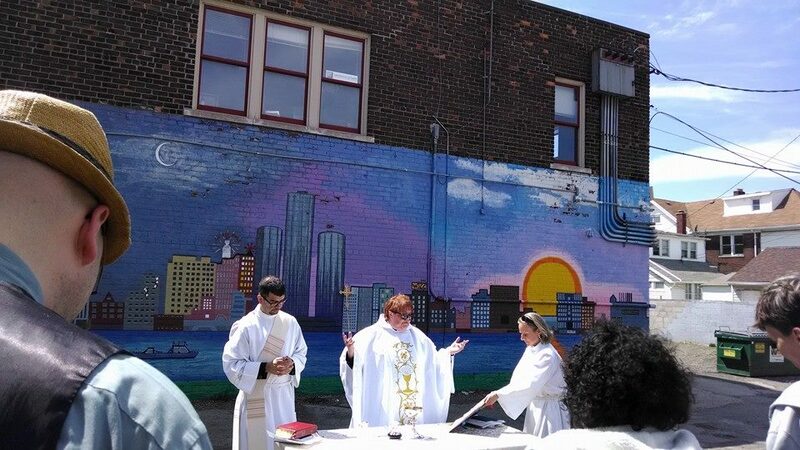 Deacon Juan Perez are the missioners of La Iglesia Detroit following the lead of the National Hispanic Missioner, the Rev. Anthony Guillen. At present, Marcia and Juan are exploring the community of Mexicantown to build relationships with the people. Since there is no physical location at present they took to the streets bringing Ashes-to-Go on Ash Wednesday and an Easter morning Eucharist. At Ministry Fair, Marcia and Juan presented a workshop so that we might learn how to form hospitable communities of faith that nourish, strengthen, and develop disciples of Christ in the Anglican tradition through the lens of Latino ministry. Next week, we’ll discuss more of the specifics of La Iglesia Detroit so stay tuned for more about this important new ministry!